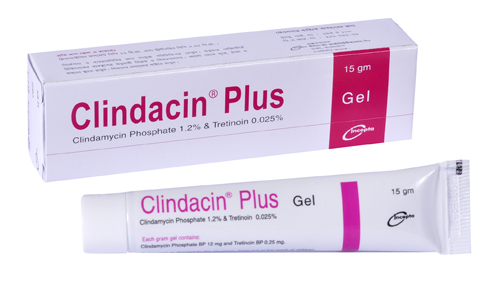 Clindacin plus gel: Each gram gel contains Clindamycinb Phosphate BP equivalent to Clindamycin 12 mg and Tretinoin BP 0.25 mg.
Tretinoin is a retinoid that is commonly used to treat acne vulgaris. It decreases cohesiveness of follicular epithelial cells with decreased microcomedo formation. Additionally, tretinoin stimulates mitotic activity and increased turnover of follicular epithelial cells causing extrusion of the comedones. Microbiology: Aerobic gram-positive cocci, including: Staphylococcus aureus, Staphylococcus epidermidis (penicillinase and non-penicillinase producing strains), Streptococci, Pneumococci. Anaerobic gram-negative bacilli, including: Bacteroides species, Fusobacterium species. Anaerobic gram-positive non-spore forming bacilli, including: Propionibacterium species, Eubacterium species, Actinomyces species. Anaerobic and microaerophilic gram-positive cocci, including: Peptococcus species, Peptostreptococcus species, Microaerophilic streptococci, C. perfringes. Clindacin plus gel is indicated in the treatment of acne vulgaris. Clindacin plus gel: When the skin is completely dried (about 30 minutes later) apply a pea-size amount of Clindacin plus gel to your fingertip and spread it over your face once daily preferably at bed time. Treatment should be continued for 12 weeks or as directed by the physician. Eye, lip or nose contact should be avoided while applying Clindacin plus gel. Clindacin plus gel is not for oral, ophthalmic, or Intravaginal use. Lactation: It is not known that whether Clindamycin or tretinoin excreted through breast milk following topical administration. However, Clindacin plus gel can be used during lactation with caution.